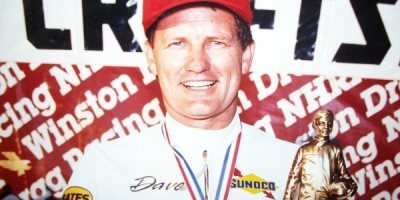 On February 11, 2001, the world lost the greatest Pro Stock Motorcycle champion in history. February 11, 2001- the world of drag racing lost the greatest Pro Stock Motorcycle champion the sport had ever turned out. Motorcycle champion the sport had ever turned out. In the many seasons that have passed since his death, his 45 national event wins and six world championships are still records. But while it’s easy to get caught up in the remarkable stats Dave amassed during his legendary career, my own memories of this outstanding racer are more personal and indelible. 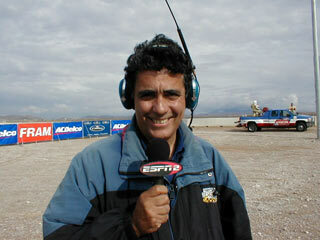 I began my motorsports television career in 1994 as an Associate Producer at Diamond P Sports for NHRA Today on the old TNN network. This was a major step in my own professional journey and the chance to work beside many more gifted television veterans AND meet, interview, and mingle with the biggest stars in drag racing was indescribable. 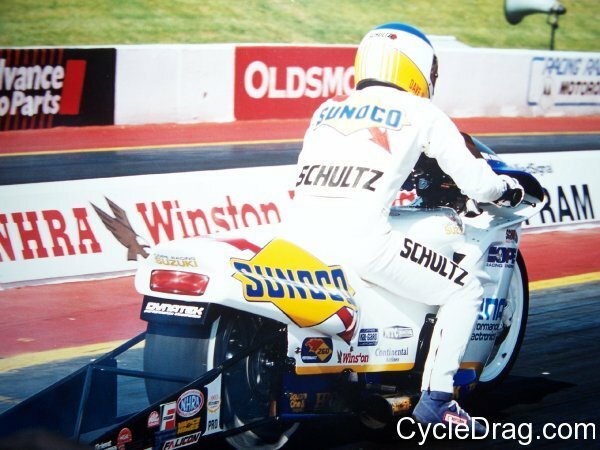 I had a lot of homework to do preparing for my new position and the first stop I made when beginning to study up on the Pro Stock Motorcycle class was at the brightly-colored pit area bearing the yellow-and-blue banners of Sunoco-sponsored Dave Schultz. Dave Schultz and Star Racing’s John Myers produced one of the greatest rivalries in NHRA history. 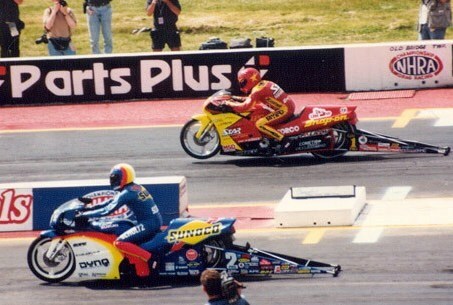 It was March of 1994 and I was gathering feature material for NHRA Today at the Mac Tools Gatornationals in Gainesville, Florida—the first Pro Stock Motorcycle race on the schedule. I walked into Dave’s pit and introduced myself to both Dave and his wife, Meredith, who were busy (as always) prepping the team’s Sunoco Suzuki for the impending qualifying round. I will always be impressed with how, despite his intense focus on getting set up for qualifying, Dave patiently answered all of my questions (regardless of how lame) and took me through many of the mechanicals and much of the brainwork necessary to race in that brutally competitive class. Dave Schultz’s NHRA Hall of Fame body of work speaks for itself. The 1994 season for Dave Schultz was nothing less than shattering. Out of that year’s 11 national events in which PSM competed, Dave won 9, including 8 in a row—a fete that has yet to be matched by any motorcycle racer since. His 1994 round record was 40-2 and he was never outrun. His two round losses were both suffered when he fouled out. 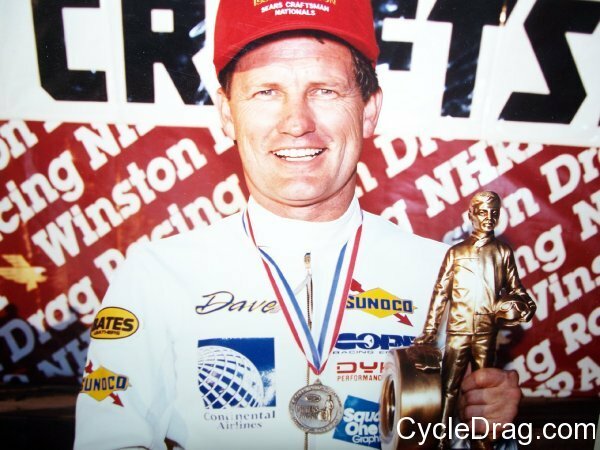 And if that were not enough, Dave and his sensational crew chief, Greg Cope, scored championships in three series for the second time in their dominant collaboration, winning titles in the NHRA, IDBA, and AMA/Prostar as they did in 1991. 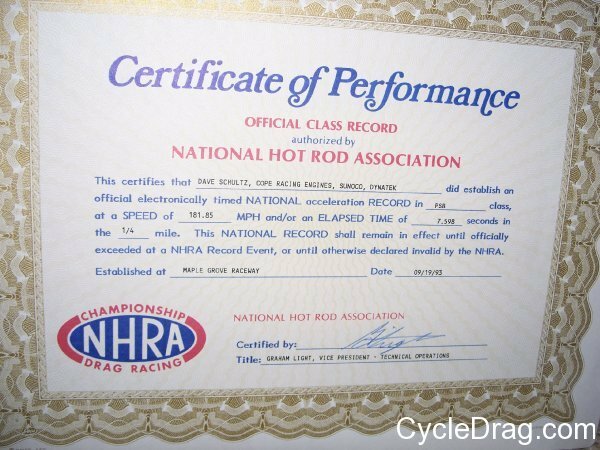 Again, his Hall of Fame body of work speaks for itself and there have been many worthy tributes already written about this greatest of motorcycle drag racers. Alongside the enduring triumphs the Schultz family celebrated together, there have also been deep losses—not only Dave’s passing in 2001 from colon cancer at age 52, but the tragic death of Dave and Meredith’s son, Brian, in an automobile accident in 2004. But for me, the most fitting and proper method of honoring his memory is to shine the light on his generosity, graciousness, and dignity as a world-class gentleman. His chiseled, handsome good looks, athletic physique, and purposeful demeanor would be right at home on a super hero and his unquenchable competitive focus could intimidate the most determined of his opponents. But on an early spring morning in Gainesville, Florida, Dave Schultz freely gave a good-sized chunk of his valuable time to a young broadcaster who figured if he wanted to do his best, he’d better learn from the best. Dave Schultz passed away on February 11th, but the anniversary of his death did not go by unnoticed by this reporter. 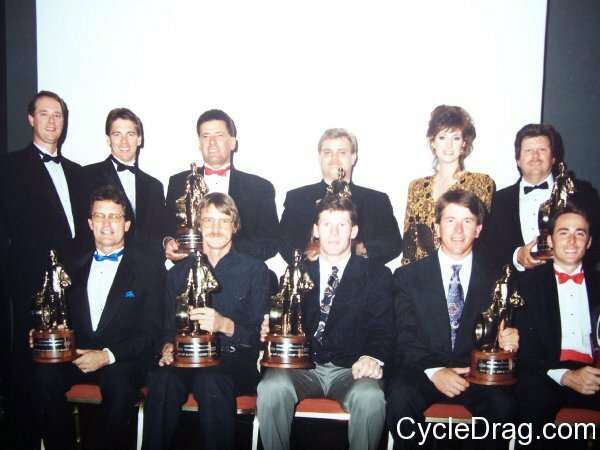 Dave Schultz along with John Force and several other legendary NHRA champions. Dave Schultz passed away 14 years ago on February 11th, but the anniversary of his death did not go by unnoticed by this reporter. Pure Class Act. Always one step ahead of the competition. I met Dave at E-Town, got to know him during the early years of Pro Star. I once needed some advice so I went to Dave’s trailer and I was floored he remembered my name. A classier guy the never was….I know this is about one of them but both are extremely missed.